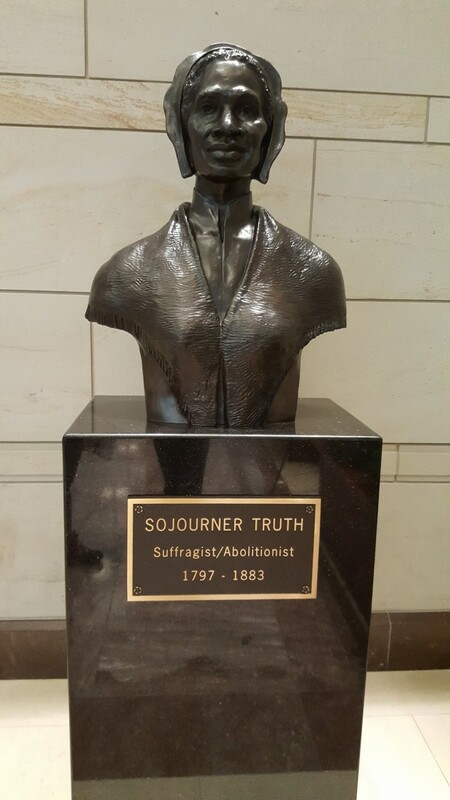 This is a picture of Sojourner Truth which was taken in Washington DC. She was born in the year 1797 and died in the year 1883. She was a prominent abolitionist and women’s right activist. She was born a slave in New York State. Unfortunately, she had to experience three of her children sold away from her. After a successful escape from slavery, she turned to religion and became involved in moral reforms and abolitionist work. She was known to be a powerful and passionate speaker and is best known for “Ain’t I a Women” speech in 1851. She had no formal education but was a powerful force in the era in which she lived. She even was said to have challenged Fredrick Douglass on the issues of violence against slavery. During the Civil War, she was as brave as to walk the street collecting food and clothing for the black regiments. She was a big activist for educating children. She was said to have denounced racism stating that “it is hard for the old slaveholding spirit to die, but die it must.” This shows that she is looking towards the future and will not be filled with regrets. She died of old age in 1883 having quite a large funeral. Sojourner Truth was a woman of strength. She was born into slavery but did not let that break her and cause her to doubt herself. She mustered the courage to escape but then became a vital part of a community which supports women’s rights and aimed to end slavery. She had no formal education but seemed to be a quick learner. She was outspoken and a great speaker. This is a trait in which I admire about her. Coming from her background one would expect her to have difficulties presenting her emotions and thoughts. However, she does not give in and does her best to show the world that she can make a difference and in fact she has. Truth is a brave woman from a time of which brave women were much needed. She duly deserves this commemoration of hers. She was a very interesting individual and will forever be a part of America’s history. 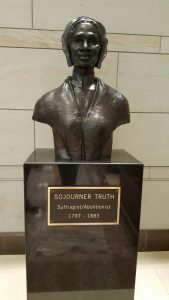 Citation: History.com Staff, Sojourner TruthHistory.com (2009), http://www.history.com/topics/black-history/sojourner-truth (last visited May 24, 2017).